Cut cauliflower into small florets. In a pan, boil water adding little salt and 1/2 tsp turmeric powder. Add cauliflower florets into this for about 10 minutes. Drain the water and keep it aside. In a bowl, add plain flour, cornflour, chilli powder, cumin powder, ginger-garlic paste, red food colour and salt and make a thick batter adding enough water. Add the drained cauliflower into this batter and marinate for 30 minutes. Looks so crispy..want to grab one. Crispy gobi 65, wish i get a plate rite now. 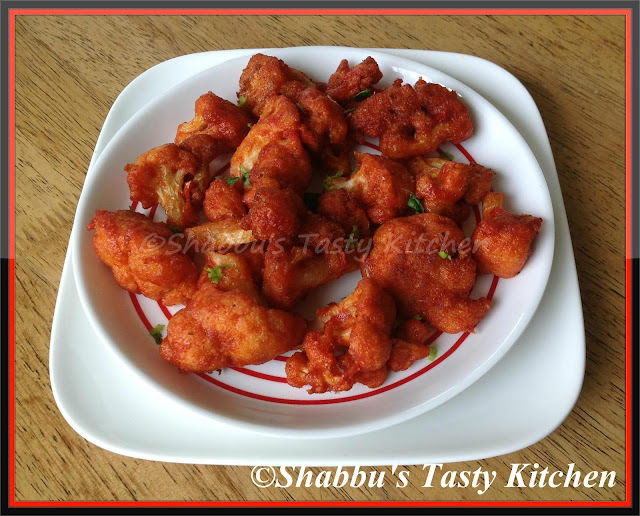 Crispy gobi 65.. Very inviting! cauliflower 65 looks perfect and delicious.